Players play it large – Never seen before promotions! As Viacom 18 & Burmawala Brothers’s Players, the official Bollywood remake of the Hollywood crime thriller The Italian Job closes in on its release, the film is receiving an unprecedented response as Players -Abhishek Bachchan, Sonam Kapoor, Neil Nitin Mukesh, Bipasha Basu, Bobby Deol, Sikander Kher and Omi Vaidya – take the nation by storm. The team of the Abbas-Mustan thriller went out on a limb and took time out of their busy schedules to promote the film on a pan–India level. As per official Foresight Analytics reports Players moved up from 29 to 32 on FTI. Interestingly, the improvement in FTI numbers of the film comes from Spontaneous Awareness (SA). The jump in SA is about 10.0 per cent points in just one week. With an increase in SA and FTI, Players is expected to open brilliantly with numbers coming from men and women in the 25+ age group. The Players kick started their tour in Mumbai with a never-seen-before music launch via an action-packed event with the stars performing stunts in front of a live audience. Followed by Abhishek Bachchan’s trip to Nagpur and Jaipur where he was joined by Abbas-Mustan. Talking about their fast-paced action thriller Abbas-Mustan said: “People love the commotion in such films. The way the actors escape through tunnels and drainage pipes makes the film interesting. The double crossing and the scheming and plotting are something which keeps them glued to the screen. This is what we have retained in our film as well”. While in Jaipur, Abhishek didn’t forget to make a pit-stop at Ajmer Sharif, while Sonam Kapoor and Bobby Deol set temperatures soaring in Chandigarh as they spoke about their characters in the film. The next day was nothing short of hectic as the Players split to travel to different cities. 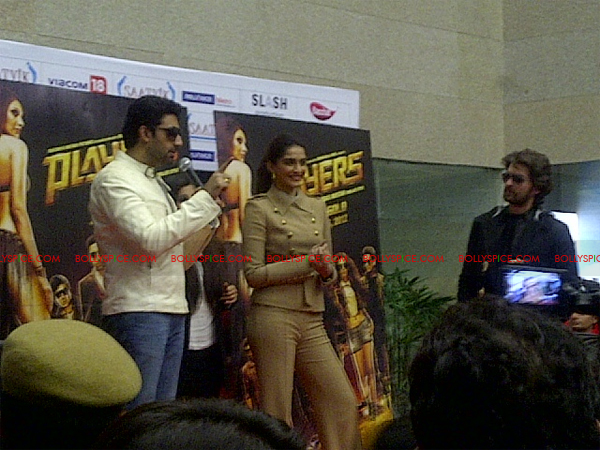 While Abhishek Bachchan and Neil Nitin Mukesh traveled to Lucknow, Sonam visited Pune and Bipasha took off to Kolkata. While in the city Bipasha Basu said: “Players reflects the present age, and the change in look and feel is apparent and important. I am here in my favorite city at this time of the year and happy to soak in the Christmas-New Year celebrations in Kolkata”. Sonam Kapoor was the cynouse of all eyes at Cinemax, Inorbit Mall, Pune as she waved cheerfully to the crowds. Medical students were sure in for a treat as they were visited by Abhishek Bachchan and Neil Nitin Mukesh who spoke to them at length and then dropped into radio stations. “It was a wonderful experience working on Players. Abaas-Mustan wrote a brilliant script and have made a lovely movie. Players is a masaledaar entertainer,” said Abhishek Bachchan. The next city on the cards was Delhi – The capital city was abuzz with the Players bowling game at PVR Ambience Mall’s Blu-O bowling alley, where Players Abhishek Bachchan, Sonam Kapoor, Bipasha Basu and Neil Nitin Mukesh went head-to-head to win an exclusive all-gold pin. No guesses here, Abhishek Bachchan who made an impressive 78 score, walked away with the coveted trophy as teammate Bipasha Basu cheered him on. The Delhi Metros was the place to be as audiences caught Players Abhishek Bachchan, Sonam Kapoor and Neil Nitin Mukesh in action, as they unlocked a vault on the metros in the capital city. As part of the film’s promotions, the Players orchestrated a train heist much to their onlookers delight, in sync with the theme of the film. Post which they boarded the train followed by a friendly media interaction and thrilled their fans with some merchandise from the film. The team is pulling out all stops to promote the film and recently also visited Indore, where Abhishek Bachchan and Sonam Kapoor visited the budding chartered accountants in the city to boost their morale. Leaving behind the cliché red carpet,the Players also walked the “gold carpet” on the 4th January, at a special fan screening in Dubai. Now, Abhishek Bachchan is expected to meet and greet his fans tomorrow on the release day, 6th January in London at Cineworld Feltham while the rest of the cast will promote the film in India. Players starring Abhishek Bachchan, Sonam Kapoor, Neil Nitin Mukesh, Bipasha Basu, Bobby Deol, Sikander Kher and Omi Vaidya races to a theatre near you 6th January, 2012.